The Liberian Ministry of Health and Social Welfare has released its latest numbers with their data confirmed to 5 October 2014. The Ebola in Liberia infographic charts the spread of the Ebola Virus Disease (EVD) by county. Each figure represents 10 lives. Note: The cases versus deaths in Maryland County are not a typo with the Ministry recording 8-cases and 9-deaths. Ministry of Health and Social Welfare. Liberia Ebola Sitrep no. 142. Government of Liberia. Accessed 10 October 2014. Ministry of Health and Social Welfare. 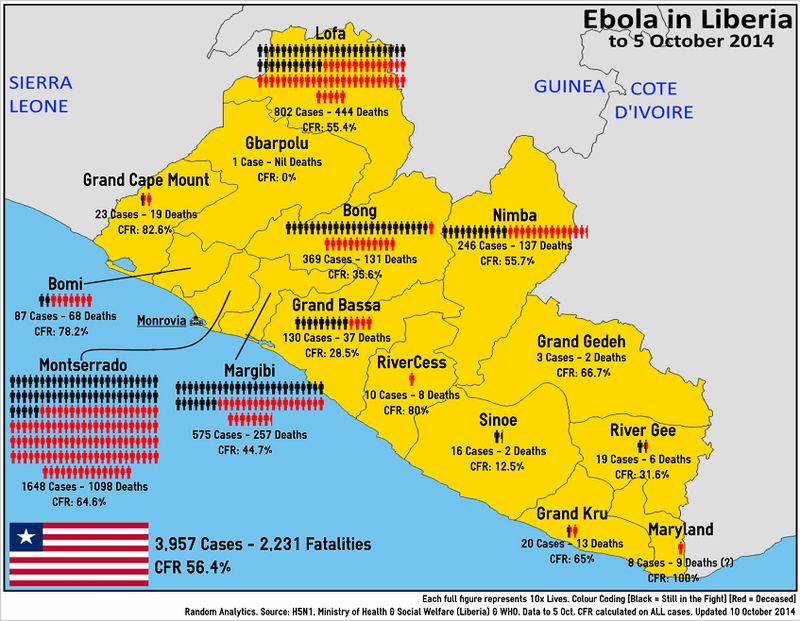 Liberia Ebola Sitrep no. 143. Government of Liberia. Accessed 10 October 2014.